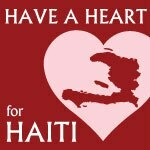 A couple of weeks ago I announced my plan to launch the Boston Mamas Have a Heart for Haiti campaign. I’m thrilled to share this group of talented and generous Boston Mamas mamapreneur network members who are donating a percentage of sales collected from February 1 - 15 to the campaign. Proceeds will be directed to UNICEF, which is absorbing administrative costs so that 100% of every dollar donated goes directly to relief efforts for children in Haiti. So please shop these vendors and shop them generously! Your dollars will do double duty by supporting local women business owners and relief efforts in Haiti. If you are a local mamapreneur and want to participate, it’s not too late! Simply join the network and I'll follow up with details. Plus, Kristen Chase is donating 15% of book sales from The Mominatrix Boston event to this campaign. And with gratitude to the phenomenal folks at Magic Beans and Isis Maternity for serving as promotional partners to help get the word out!